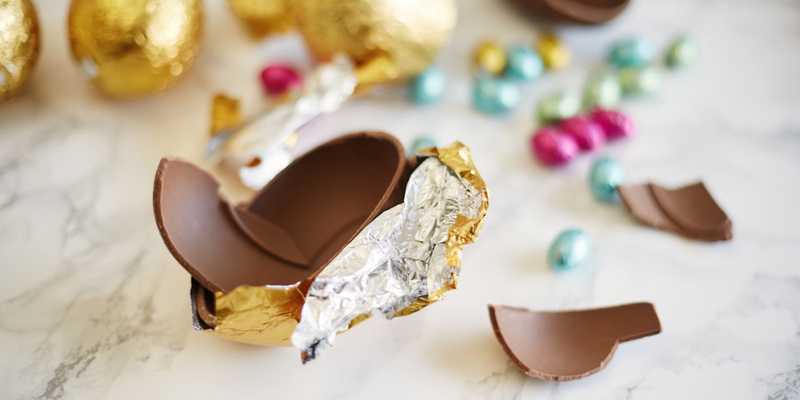 Chocolate lovers could be getting more chocolate than they expected to this year, according to our latest Easter egg research. 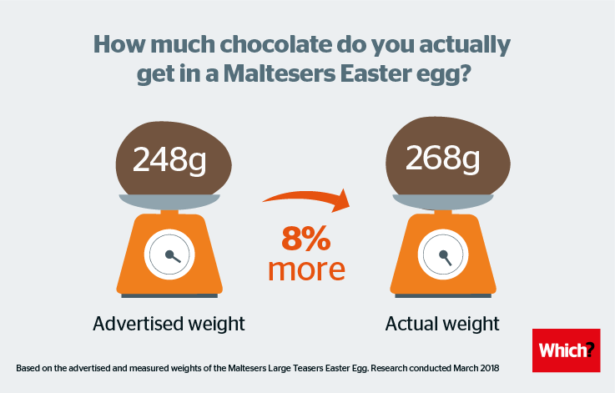 We compared 10 of the bestselling branded Easter eggs in the UK and found that once unwrapped, the Maltesers Large Teasers Easter egg weighed a staggering 20g more than the 248g promised on its packaging. That’s 8.1% more chocolate for your money. We also compared the eggs for how much excess packaging they came in. 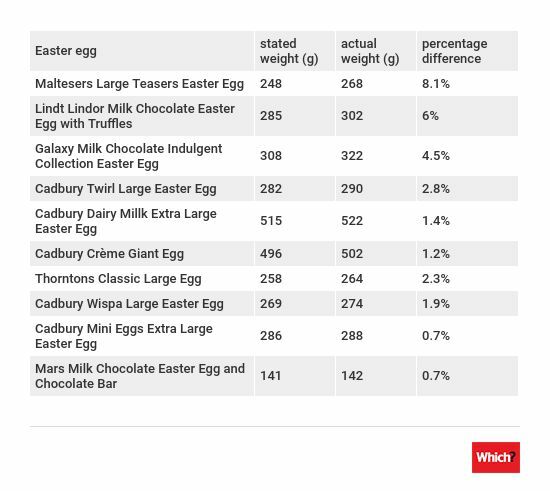 The Maltesers Large Teasers egg did relatively well here too, although 21.6% of its total weight is packaging. To find out more, head to our investigation into the truth about Easter egg packaging. The second biggest difference in advertised and actual weight was that of the Lindt Lindor Chocolate Easter egg with Truffles. When we weighed this egg, we found it comes with 17g more chocolate than the packaging states. Our weighing test showed that, on average, you get 3% more chocolate than the packaging states from the bestselling branded Easter eggs. That works out at around 9g, equivalent to half a Cadbury Freddo bar (18g). The other Easter eggs all came with more chocolate than we expected. Even the Mars Easter Egg with Chocolate Bar gave us 0.7% more chocolate than the box said. Trading Standards sets an accepted margin of error, or ‘tolerable negative error’ (TNE), for all packaged food. Nothing can weigh less than the relevant TNE for its weight group. For products that weigh between 200-300g, the margin for error is 9g. Luckily for chocoholics, it seems that manufacturers are erring on the side of caution when it comes to Easter eggs. We also calculated the value for money of Easter eggs compared with normal chocolate bars, and have egg-cellent results for Cadbury Wispa fans. Buying these Easter eggs is actually cheaper than buying their bar equivalents. 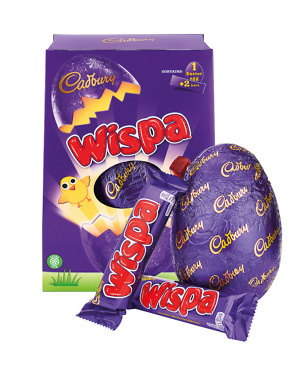 The Cadbury Wispa Large Easter egg (269g), which comes with two Wispa bars and a chocolate egg, costs £1.40 per 100g, while a Wispa bar (39g), costs £1.71 per 100g. While you do get more chocolate, you don’t get more Wispa, as the Dairy Milk chocolate that is used to make the egg is a less complex recipe. But if you’re after a bargain buy this Easter weekend, this is a good choice. Cadbury Twirl and Mars Bar Easter eggs are also cheaper than their bar equivalents, costing 8% and 10% less per 100g, respectively. On the other hand, the UK’s bestselling Easter egg, Cadbury’s Dairy Milk Extra Large Easter egg (515g), costs an average of £1.69 per 100g, which is 39% more per 100g than the standard 200g bar. If you’re looking to splash out, the Lindt Lindor Milk Chocolate Easter Egg with Lindor Mini Eggs (215g) claims the biggest mark-up at 51%. It costs £2.99 per 100g, while the 100g Lindt Lindor Milk Chocolate Bar costs £1.47 per 100g. If you want to find out more about our regular research into grocery pricing, head to our monthly supermarket price comparison. We bought the top 10 branded Easter eggs that take up the biggest share of the Easter chocolate egg market for our snapshot investigation into Easter egg weight. The list included Thornton’s Classic Large Easter egg 258g, Lindt Lindor Milk Chocolate Easter egg with truffles 215g, Cadbury Creme Giant egg 496g, Mars Milk Chocolate Easter egg and Chocolate Bar 141g, Cadbury Mini Eggs Extra Large Easter Egg 286g, Cadbury Dairy Milk Extra Large Easter egg 515g, Galaxy Milk Chocolate Indulgent Collection Easter egg 308g, Maltesers Large Teasers Easter egg 248g, Cadbury Wispa Large Easter egg 269g and Cadbury Twirl Large Easter egg 282g. To find out how the actual chocolate weight compared with the advertised weight, we completely unpacked the eggs, along with any accompanying bars or other chocolates, and weighed them. We then compared the average online prices of the Easter eggs and their equivalent chocolate bars across Asda, Morrisons, Sainsbury’s and Tesco between 23 and 25 February 2018 to come up with an average price for both eggs and bars. Finally, we crunched the numbers to work out how the bars and eggs compared.